Twin Views invites you to put your feet up and relax whilst taking in the stunning views. Located in the main township of Oneroa, a short walk will take you to one of our four local beaches or 10-15 minute drive will have you on Palm Beach or Onetangi Beach. Each of the three bedrooms is sun drenched. Two have queen sized beds and panoramic views, whilst the downstairs third bedroom has two singles. There is an ensuite with shower and toilet attached to the upstairs master bedroom and this is where you will also find the second queen room. There is a large bathroom with bath, gourmet kitchen, third bedroom, dining area and an open plan living arrangement located on the first floor. Pets considered on application only. A security deposit of $300 is required for each booking. This fee is fully refundable if no damage to the property is recorded and further cleaning is not required. Great views, quiet, comfortable, clean and not far from town. Great views, quiet, comfortable, clean and not far from town. Would suggest a rubbish bin in upstairs bathroom and a small carton of milk in the fridge on arrival day. As we arrived later than expected and had to rush off quickly to a family function we didn't realise until late at night that we had no milk. Would certainly stay here again. Absolutely fantastic house and property, as advertised amazing views - made us not want to leave the house at all. Very well equipped, maintained and cleaned. We hope to stay again soon. Great place, great views, great location! Cosy; comfortable beds; great entertaining; pretty garden; fabulous views; easy 20 min walk to town. 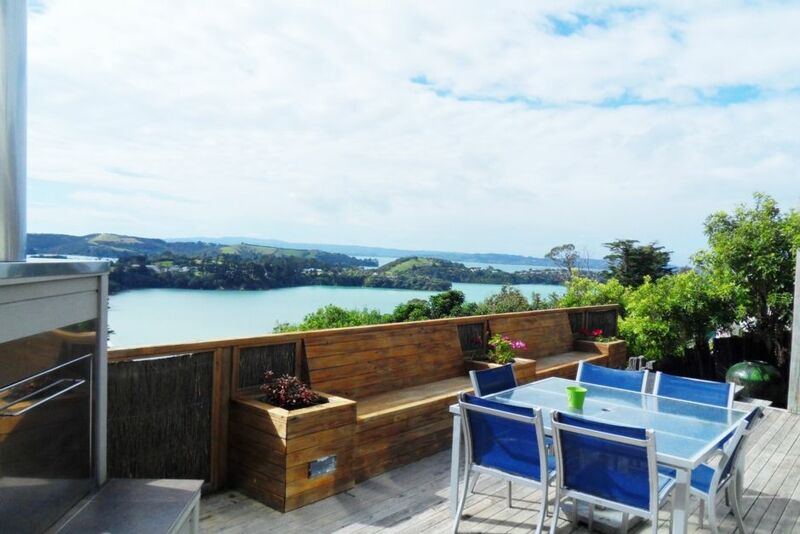 Great location - easy walk into Oneroa and fantastic views! We fully recommend this member. Prompt payment and left the home in a very clean condition. We hope they come back again. Fantastic location overlooking two different beaches. Fantastic location overlooking two different beaches. The bach had everything in it you could need and the upstairs bedrooms have lovely views. In particular we enjoyed the fireplace on the deck. The driveway is very steep though, we parked at the bottom. The driveway is approximately 18 meters in length and is there are a lot steeper driveways associated with houses on the island with dominant views such as Twin Views.